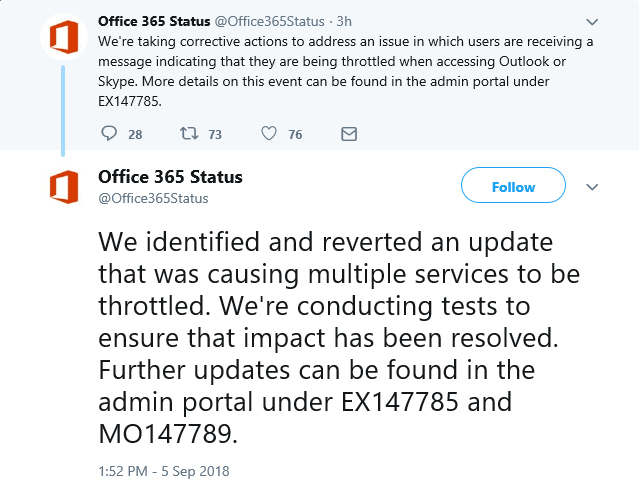 On the heels of yesterday’s extended Office 365 outage, Microsoft applied a software update today that caused Office 365 users to get a “Throttled” message. This error intermittently prevented login for Outlook and Skype for Business starting at approximately 1PM CDT and lasting about 2 hours before the update was reverted. Outlook web app and Outlook for mobile phones was not affected. These incidents my be reviewed in the Office 365 Admin Portal – Service Health. User impact: Users may receive a message indicating they are being throttled when accessing Outlook or Skype. User Impact: Users may have received a message indicating they were being throttled when accessing Outlook or Skype. More info: Throttling messages were received when accessing Outlook, Skype, OneNote, OneDrive or other Office Client apps. This service incident was related to MO147789. Final status: We’ve reverted the update and have confirmed that the issue is resolved. Previously affected users may need to restart their Outlook client to receive the fix. Scope of impact: This issue could have potentially affected any of your users intermittently if they were routed through the affected infrastructure. Preliminary root cause: As part of our follow-up remediation actions stemming from the issue reported under service incident MO147606, an update was introduced to the components that manage authentication; however, this update caused users to receive a message indicating they were being throttled. – We’re reviewing our update procedures to better identify similar issues during our development and testing cycles. User impact: Users may receive a message indicating they are being throttled when accessing Office services. User Impact: Users may have received a message indicating they were being throttled when accessing Office services. More info: Throttling messages were received when accessing Outlook, Skype, OneNote, OneDrive or other Office Client apps. Final status: We’ve reverted the update and have confirmed that the issue is resolved. The downtime is linked to tropical storms and lightning strikes that caused a power spike in Microsoft’s San Antonio data center, knocking out cooling systems and forcing servers and services to shut down. The errant update was introduced to try and remedy the outage more quickly but resulted in preventing some users from logging on at all.